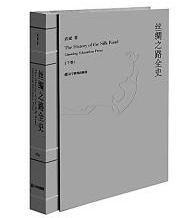 The History of the Silk Road by Wu Bin, former vice president of the Liaoning Academy of Social Sciences, shows us an overview of the Silk Road by means of combining historical literature, archaeological materials, myths and legends. The book covers a lot of content including the early development of the Silk Road and Zhang Qian’s serving as an envoy to establish official communications with the kingdoms in the Western Regions, west of the Han Empire. The book also discusses the merchants, the exchange of goods, the dissemination of religion and the sharing of arts, including music and dance, along the Silk Road. In addition, the Maritime Silk Road during the Sui, Tang, Song and Yuan dynasties and the Eastern Maritime Silk Road are covered. The book also includes the events of Zheng He’s voyages (1405–1431) in the South Seas as far as Africa as well as the age of great navigation. The author references the Silk Road in both a narrow and a broad sense. The communications between China and Koryo by land and with Japan by sea are covered in the book. The Tea Horse Road that connected China and the countries in Southern Asia and Southeast Asia, the Tea Road between China and Russia, and the Chinaware Road between China and European countries are also taken into consideration. This book gives us an overall picture of the nations, regions and the migration of different ethnic groups as well as cultural and economic exchanges along the routes. Wu admires the communication that took place via post station traffic during the Song and Yuan dynasties. He stresses that Zhang Qian was the one who made official communication between China and the kingdoms in the Western Regions possible. However, he acknowledges that before Zhang Qian, non-governmental channels for trade and cultural exchange had long existed. The land Silk Road was the oldest road for communication between China and the West. However, traffic and transportation by land cost a lot and also could not ensure complete security. Therefore, the Maritime Silk Road played an increasing role in connecting China and the West as navigational technologies advanced. After the Great Geographical Discoveries in the 15th century, the Maritime Silk Road gradually replaced the land Silk Road and became the major channel for communication between China and the West. The Silk Roads were not only trade routes, but also networks for cultural exchanges. Religion, music and dance as well as food culture, science, technology, and languages were exchanged among countries and ethnic groups along the roads. It is widely known that Buddhism was introduced into China through the Silk Roads, after which, Buddhism gradually became a part of Chinese culture.